Otter? Aww-tter's more like it. 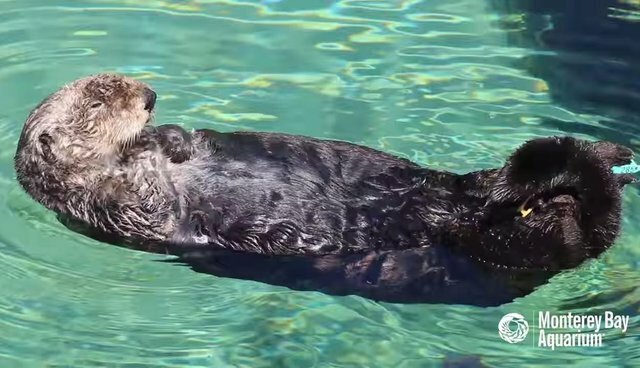 Folks in Monterey Bay, California, were treated to a sweet sight this week after a wild sea otter decided to stop by the local aquarium for a rare visit. The furry mammal was spotted floating in typically adorable fashion in the facility's artificial tide pool, evidently having determined the spot would be the perfect place to take an afternoon nap. After stirring from his slumber, the sea otter then proceeded to give himself a hardy little rubdown - normal grooming behavior, writes the Monterey Bay Aquarium staff - before heading back out to snack. The species was once driven to near-extinction by fur trappers, reduced to a population of only around 50 otters by 1911. Thanks to conservation efforts, however, their numbers have since rebounded to about 3,000 - helping to ensure future generations will have the chance to gush over these animals in the wild, too.